After the first rider on course, Tina Cook on Star Witness, galloped around with a double clear, speculation was rife that this year’s Burghley XC course was too easy. 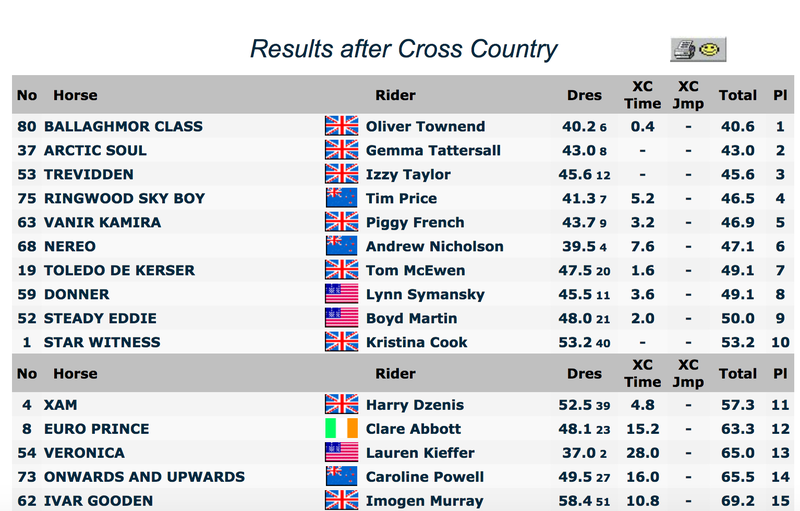 By the end of the day, that misconception had been put to rest as the course caught out some of the biggest names in eventing, and shuffled the lederboard considerably and leaving it open for Oliver Townend to move into the lead on a horse making his four star debut — Ballaghmor Class. The Burghley lederboard looks a bit different after cross country. The biggest shock of the day was when Michael Jung retired La Biosthetique Sam FBW, after the gelding ran out at the first of the triple brushes at the Trout Hatchery, costing him 20 points. This was the first time the gelding had accumulated a cross country jumping penalty in his international career. Another surprise was when overnight leader Mark Todd parted company with Leonidas II at Discovery Valley, dashing his hopes for a sixth Burghley win. In the end, Tina Cook’s double clear was an anomaly. Only two other pairs made the optimum time of 11 minutes, 14 seconds. Seventy five percent of the 60 starters completed, but only fifty percent jumped clean. Fifteen pairs were eliminated or retired on course.